Tesla snaps four-day losing streak after shares rebound in late trading, rebounding off a 5.6 percent decline earlier in the session. Tesla shares dropped Monday morning after J.P. Morgan slashed its year-end price target to $195 a share from $308. Tesla's stock snapped a four-day losing streak Monday after its share price fell below $300 per share earlier in the session. Shares of the electric car marker dipped as much as 5.6 percent Monday morning as investors continued to doubt the validity of a privatization proposal by founder Elon Musk. Shares of the Palo Alto, California-based company fell as low as $288.20 before closing up nearly 1 percent at $308.44. 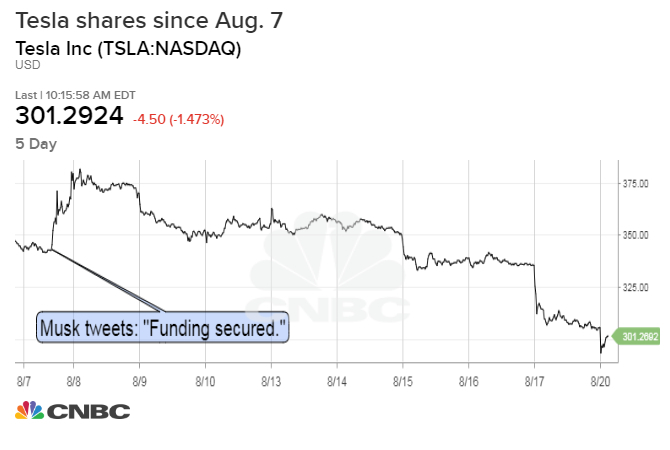 Earlier Monday, J.P. Morgan slashed its projections for the carmaker, telling clients that while it originally took chief executive Elon Musk's proposal to take the company private at $420 per share seriously, the funding to do so "appears to not have been secured." Shares also fell after news broke that PIF, the Saudi Arabian sovereign wealth fund that Musk has said could help him fund an offer to take the car company private, is in talks to invest in rival Lucid Motors, Reuters reported cited sources. He told the newspaper he's overwhelmed by the job, has been working up to 120 hours per week and takes Ambien to fall asleep on occasion. Musk told the Huffington Post founder in a tweet Sunday morning that his car company and Ford are the only two American automakers that have avoided bankruptcy. He then added, in an apparent reference to his long workweek: "You think this is an option. It's not." WATCH: Is it game over for Elon Musk?